Heavy duty, fully electronic scales designed for above ground or pit-type use. 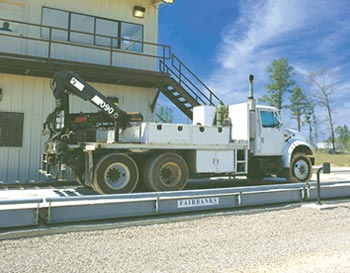 Each Megabar features a factory poured and cured concrete deck made from Fairbanks' patented Megabar concrete formula — the strongest deck building material on today's market.The Megabar is the perfect solution for applications that demand up to 300 standard truck weighments a day at 60K DTAC/CLC or 80K DTAC/CLC. Fairbanks' exclusive Intalogix® Technology is a standard feature of the Megabar. Custom lengths are available.